History and scenic vistas combine at the Iroquois Boating and Fishing Club to create a fabulous boating, dining and water sports facility. Located an hour north of Pittsburgh in Conneaut Lake, Pennsylvania, the Iroquois Club is one of the oldest private charter membership clubs in the U.S. The word "Conneaut," an Iroquois Indian term, means "snow water." Built in 1887 along the picturesque Conneaut Lake, Pennsylvania's largest natural lake measures three miles long by one mile wide. Fire destroyed the original structure in 1926, but the membership refused to accept the loss of their beloved club. They constructed a new building-now occupying 40 acres-in 1927. 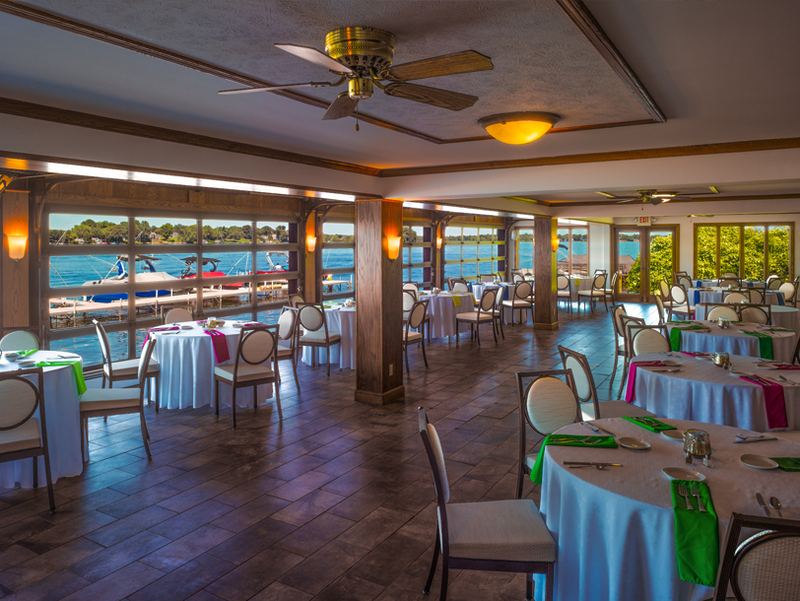 Assistant General Manager Judson Hunter says, "Our club offers magnificent panoramic views. The Iroquois Boating and Fishing Club is a family-oriented fine dining club. Although we do not offer water sports, our complex does have a beach and a 26-slip marina. Many of our members have second residences in the area. They wish to dine as well here as they do at their primary homes. To accommodate them, we have created food and wine dinners in a casual atmosphere." The tree-shaded South Lawn, between the beach and the lounge, is an informal area with three natural gas fire pits and wicker seating. A tent and pavers enhance its use for ceremonies and parties. The bylaws of the member-owned Iroquois Club permit 275 full-time members and many more candidates seek full membership status. Hunter says, "The Iroquois is so appealing and welcoming that we presently have 130 applicants on a waiting list." Hunter, a 30-year restaurant veteran, works with his mother, General Manager Sandy Hunter, whose own experience totals 50 years. The two maintain long hours during the10-month season that spans from mid-March to New Year's Eve. During that time they employ 30, but later adjust their hours after Labor Day. What motivates Hunter, his mother and their staff to spend so much time and effort at the Iroquois Club? He says the answer is simple...they like people and try to create a truly hospitable family atmosphere. 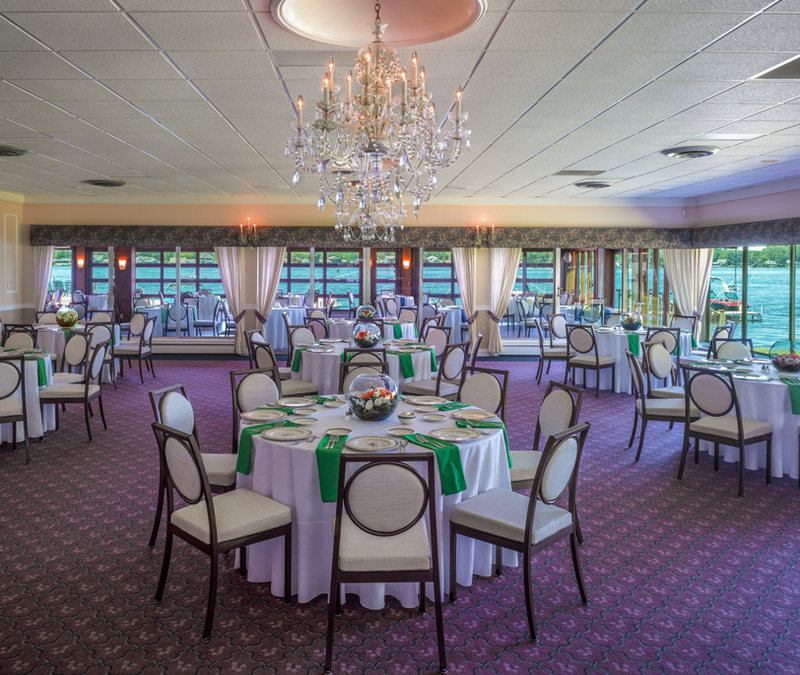 Beginning in 2017, the Iroquois Club underwent an extensive interior renovation. Three distinct venues emerged, each with its own purpose and decor. The Lounge is casual, where customers may sit around the bar to enjoy a more relaxed experience. The Patio, an all-weather space for 85 guests, is a white linen dining room that overlooks the lake. Weather conditions determine whether overhead doors remain open or are closed. An all-wooden dance floor connects to the more formal 125-seat Main Dining Room. These refurbished dining/lounge spaces needed new fashionable, functional seating. Following the renovation's completion last April, Hunter ordered 250 Georgetown Stack chairs from Gasser Chair Company. This was their first purchase from Gasser and Hunter confirms he could not be more satisfied with their product and service. He was unfamiliar with the company, but coincidentally crossed paths twice with Gasser personnel within a short time frame. As members of the Country Club Managers of America (CCMA) association, Hunter attended a trade show in Pittsburgh in 2017. He met Gasser representatives who were exhibiting products and liked what he saw. Then, in March 2018, Hunter again met Gasser representatives at a second show in San Francisco. "I was impressed with the selection and didn't need to look elsewhere. 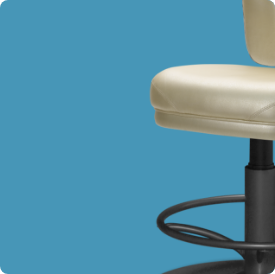 The sleek high-quality Georgetown chairs are light weight and designed with texture and depth. They are presented in a commercial form for easy storage. We can stack up to eight chairs at once and then easily move them between rooms. Other favorable features include sun resistance and durability. Because these chairs are simple to clean with hand soap, we felt comfortable in going with our first choice. We ordered the Georgetown chairs in white instead of black," states Hunter. Once the renovations were complete, Hunter requested all 250 Georgetown Stack chairs be delivered at the same time. He claims, "Prior to the delivery, I met multiple times with Jim Humphries, Gasser's Pittsburgh sales representative. The follow up to the delivery was just as professional." Hunter calls the experience a "win-win" since he is so pleased with Gasser and the chairs. "Our customers continually compliment our choice on such a stylish seat. The Georgetown chairs are so high quality that I am sure they will outlast my tenure here at the Iroquois Club," he says.